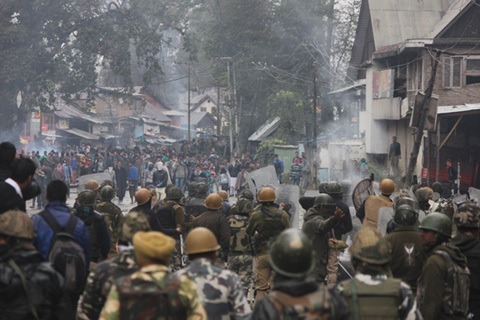 Srinagar: A civilian was killed amid clashes between protesters and armed forces following a gunfight which killed five militants in in south Kashmir’s Kulgam district on Saturday. 22 others were injured and rushed to the hsopital for treatment. Meanwhile, the bodies of the slain militants were identified as Gulzar Ahmad Padder alias Saif resident of Adijan Kulgam, Faisal Ahmad Rather alias Dawood resident of Yamrach Kulgam, Zahid Ahmad Mir alias Hashim resident of Okey Kulgam, Masroor Molvi alias Abu Darda resident of Fatehpora Anantnag and Zahoor Ahmad Lone alias Rehman Bhai resident of Nagnad Noorabad Damhal Hanjipora. They had been from Hizbul Mujahideen and Lashkar-e-Toiba. The police said that Gulzar Paddar was a close associate of Altaf Kachroo and was involved in a series of attacks including killing of five police personnel at Pambay last year along with two bank employees. “He was also involved in the killings of SPO at Krewan Chidder in Kulgam. Besides he was involved in looting police guards at Damhaal and weapon snatching cases reported across Kulgam and many other bank robbery cases attempted in the area,” the police spokesman said. Reports stated that a joint team of the Indian army and SOG launched a cordon-and-search operation at Chowgam following specific inputs about the presence of some militants. Intensifying of the searches led to the joint team firing shots at a suspected spot which triggered a gunfight.